How do atoms bond? They bond according to the how many protons and electrons they have, and where those electrons are located. The electrons orbit the nucleus of the atom in invisible territories called shells. These shells have a limited amount of space and can only hold a certain number of electrons, kind of like cages in an imaginary electron zoo! The shell that is closest to the nucleus, is called S1. It is the shell that is at the lowest energy level. Whenever electrons are added to an atom, they will be added to the lowest possible energy level (or shell) first, until that shell is filled, before moving on to higher energy levels. We get a great deal of valuable information from the periodic table. The periodic table is set up numerical order (from left to right) according to the number of protons (a.k.a. the atomic number) in the nucleus. Since atoms are neutral, we know that the number of electrons will be equal to the number of protons. For elements having more than 2 electrons, we have to go up to a higher energy level, which is the next shell. This shell is called S2 and is represents as row 2 or period 2 on the periodic table! The 2S shell is larger than the S1 shell and can hold more electrons. In fact, it can hold up to a total of 8 electrons. The S2 shell is also further away from the nucleus, which means that the electrons in this shell are not held onto as tightly as the electrons in the lower shell. The chemical attraction between the negatively-charged electrons in the electron shells and the positively-charged protons in the nucleus, gets weaker as the distance increases. At the same time, the electrons are repelled by any other electrons that they might get close to. When put all this together, we consider each shell to be a lower energy level as they progressively get further away from the nucleus. The S3 shell begins to be filled up with elements on the 3rd row (or period) of the periodic table. In biology, we are concerned mostly with elements in the first few rows of the periodic table, because these contain the essential elements for life. In fact, 96% of all living matter is composed of carbon, hydrogen, nitrogen and oxygen! The electrons in the outermost shell called "valence electrons" are of special concern to chemists and biologists. Valence electrons can interact with other atoms resulting in chemical bonding. 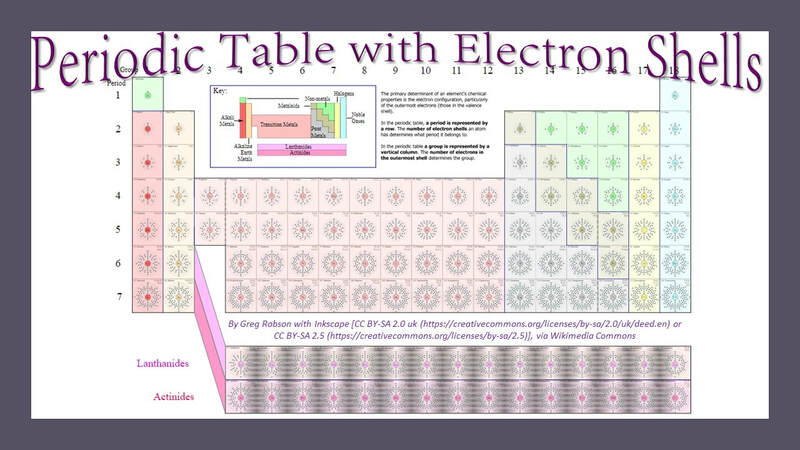 The number of valence electrons can be predicted using the periodic table as well. Here's how! The columns of the periodic table are called "groups". If we skip over the transition metals and drop the "1" on the double-digit groups, we get the number of valence electrons. For example, group 1 elements have 1 valence electron, group 2 has 2 valence electrons, group 13 has 3 valence electrons...and so on, 'til group 18 when we get 8 valence electrons. Group 8 elements are called "noble gases" and have no room to gain electrons. They also are very stable and do not want to loose any electrons. Nobel gases are "inert" or non-reactive. Atoms tend to react in such a way as to become like the nearest noble gas, because they want to be stable too! Atoms will react in such a way to be like the nearest noble gas. ​ An ionic bond, is when one atom "STEALS" one or more electrons from another atom. When this occurs, both atoms end up with a charge. 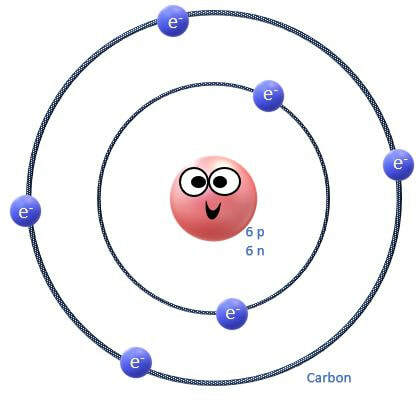 A charged atom is called an ION. 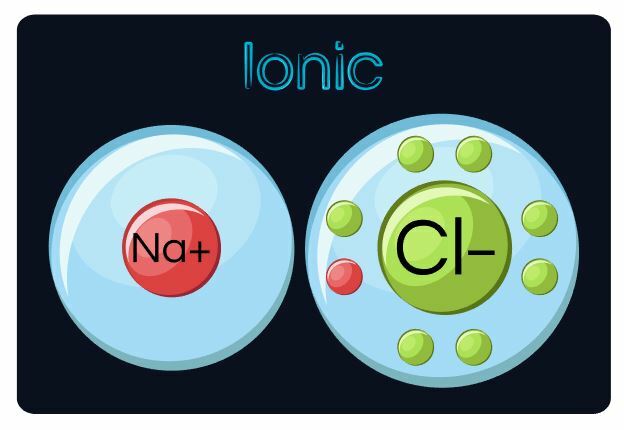 A positively-charged ion in called a CATION and a negatively-charged ion is called an ANION. For example, let's look at sodium (Na) and chloride (Cl). First, we look locate sodium(Na) and chloride (Cl) on the periodic table. We see that Na is in group 1, period 3. We will also find that Cl is in period 3 and in group 17. Let's look at what this information tells us. Na is in period 3 which means it has one or more electrons in the 3S shell. We know all the lower shells must be filled before going to the higher shells. Since Na is in group 1, Na only has 1 electron in its 3S shell. We know from the rules of bonding, that atoms react using their outermost electrons. We also know from the rules of bonding that atoms will react in such a way to mimic the closest nobel gas. wants to do, given the chance. If and when sodium looses 1 electron, it becomes a cation with a +1 charge. We can go through the same thought process using chloride. Chloride is in group 17, so it has 7 valence electrons. It is also, is period 3. So its electron shells will look like the illustration here. In this case, argon is right next door as the nearest nobel gas. All chlorine needs to do to be stable, is to gain 1 electron. If and when that happens, chlorine will become an anion with a -1 charge. ​ This is why sodium and chloride are such a great match! Sodium has an electron that it really wants to get rid of and chlorine really wants to gain an electron. When these 2 react, they both end up happy as SodiumChloride (NaCl) or salt! In a covalent bond, electrons are SHARED between the atoms. The outer shells actual overlap in this type of bond. Covalent bonds a very strong, which makes them important for building the macromolecules that organisms need like DNA and complex proteins. The backbone of these macromolecules are held together by covalent bonds. 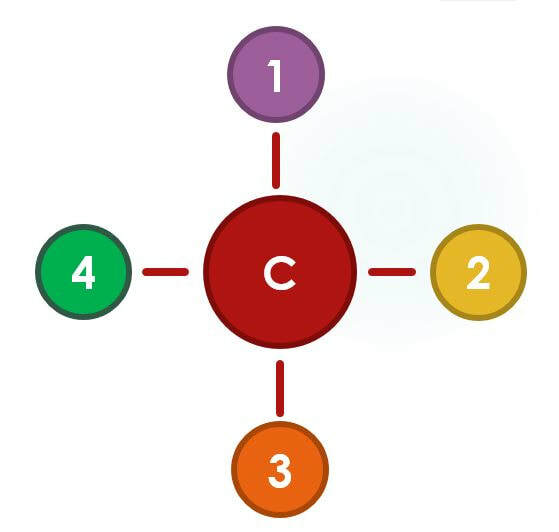 Carbon is great at covalently bonding to other atoms and it is the only element that has the ability to do so with as many as 4 different atoms at a time!